Lots has been going on in the world of keratoconus in the past few months. Collagen crosslinking, still an investigational treatment in the United States, was first performed in Europe in the late 1990s for the treatment of ectatic corneal conditions. The treatment combines riboflavin and ultraviolet A (UVA) light, allowing the formation of reactive oxygen species, with the goal of halting the progression of corneal disease. There are 2 types, epi on and epi off cxl. The Dresden technique, or “epi-off” crosslinking, is initial removal of the central 9 mm of epithelium, followed by 30 minutes of riboflavin administration. Subsequently, UVA light is applied for 30 minutes, followed by bandage contact lens placement. Epi-off crosslinking is shown to be effective in reducing keratometry readings. Results from 1 year of follow-up show that transepithelial corneal crosslinking (CXL) with iontophoresis appears to be ‘safe and effective in arresting the progression of keratoconus‘, according to Paolo Vinciguerra, MD. Dr. Vinciguerra presented outcomes data from 20 eyes of 20 patients—all with documented progressive ectatic disease—during Refractive Subspecialty Day at the annual meeting of the American Academy of Ophthalmology. The treated patients were 18 years of age and older and were seen at serial visits at 1, 3, 6, and 12 months, said Dr. Vinciguerra, of the ophthalmology department, Istituto Clinico Huanitas Rozzano, Milan, Italy. Overall, the results showed significant improvement of best-corrected visual acuity accompanied by reductions in higher-order aberrations and average keratometry readings. Safety data showed that pachymetry measurements and endothelial cell counts were stable. Some Complications were frequent epithelial defects and a case of epithelial burn. We are still waiting for the FDA in the USA to fully approve collagen cross linking for keratoconus. The delay is crazy. especially as this safe and effective treatment is widely available in Europe and elsewhere. “CXL in the U.S. is not FDA-approved. However, numerous procedures have been done and are being done under formal clinical trial protocols at over 100 clinical practices throughout the U.S.,” Hersh said. Additionally, Avedro submitted a new drug application to the FDA for CXL in September. The company is sponsoring two multicenter studies in the U.S. with a total of 452 eyes. Avedro announced the resubmission of its New Drug Application to the U.S. Food and Drug Administration for the riboflavin ophthalmic solution/KXL system. Avedro anticipates a March 2015 application action date, according to the release. A US clinical trial on cxl with LASIK (LASIK Extra) for high myopia is also scheduled for launch in early 2015, Hersh said. The 32nd congress of theEuropean Society for Cataract and Refractive Surgeons (ESCRS) was held at London’s ExCeL on September 13–17. A hot topic at this year’s ESCRS was minimally invasive corneal procedures, with a number of presentations related to collagen cross-linking (CXL) for keratoconus. Professor Farhad Hafezi, from the University of Geneva in Switzerland, told delegates that CXL studies show that’ approximately 95% of patients are stable post-op’, therefore, adults probably need only a single treatment although children may need repeated treatments. A study published in The British Journal of Ophthalmology found that corneal collagen crosslinking appeared to be an effective procedure in the management of superficial microbial keratitis. The study looked at 15 eyes of 15 patients with microbial keratitis—9 who had bacterial keratitis and 6 with fungal keratitis. The patients were treated with antibiotics and antifungals, and those who did not respond to at least two weeks of topical medications underwent corneal collagen crosslinking, plus the same preoperative topical medications afterwards. The patients were checked every third day to watch the microbial keratitis. 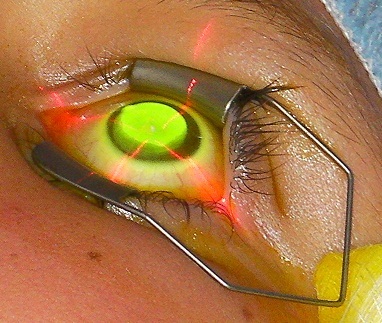 According to the study, six of the nine patients with bacterial keratitis and three of the six patients with fungal keratitis resolved after the corneal collagen crosslinking procedure. However, patients with deep stromal keratitis or endothelial plaque failed to resolve. All of the patients had resolution of pain on the first day post-op.